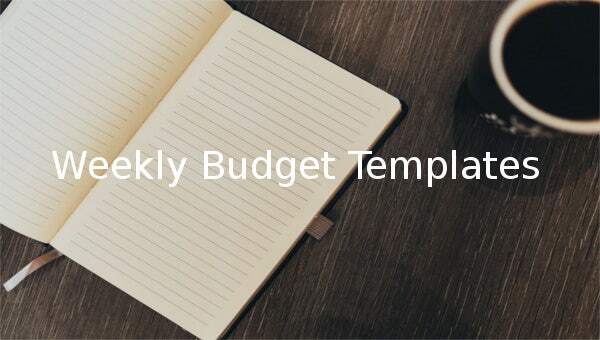 10+ Weekly Budget Templates – Free Sample, Example, Format Download! In today’s changing global economy, saving money and being financially secured is a necessity. In order to start saving; the most important decision to make is to set a BUDGET. A budget is an assessment of income versus expenditure for a defined period of time. 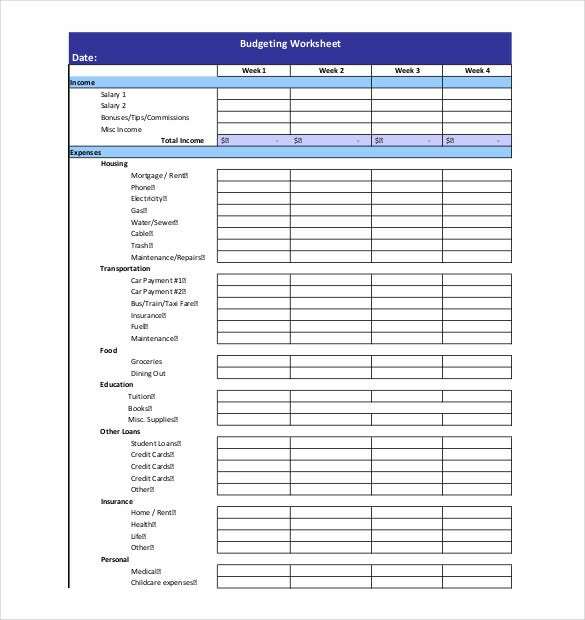 Keeping a close watch on the expenses and income helps save money in the long run and the best way to keep an eye on the budgets is by maintaining a weekly budget report, there are large number of budget templates available here to help start the saving process. This planner divides the month into 4 weeks and further to 7 days of the week. The column against each day provides space to mention the expense for that particular day and a column at the end of the week to mention the total expense for the week. 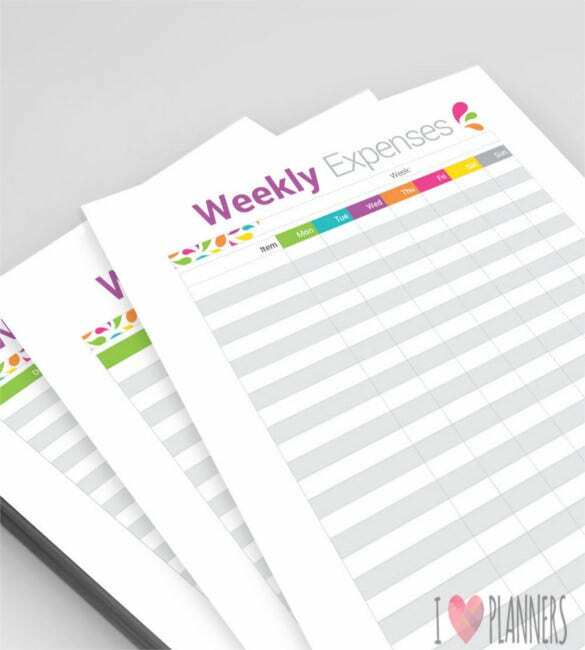 A look at the planner at the end of the month gives an overview of expenses made in each week. 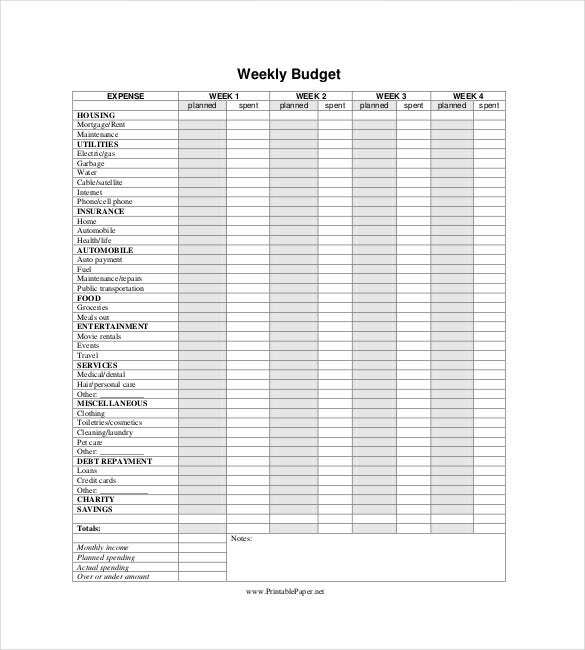 This sample is a printable version of weekly expense tracker. It bifurcates the expenses into types of expense like grocery, medical bills, movie, entertainment, shopping and other expenses and a column to mention the total expense of the week. 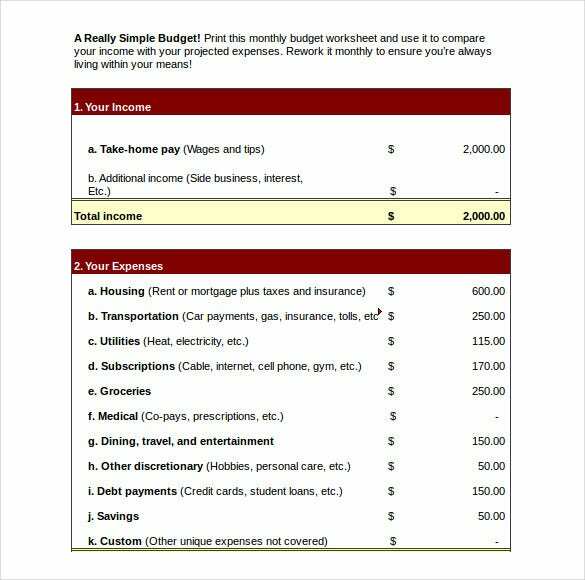 This template is an elaborate monthly budget sheet that provides information about the Income, Savings, and Expenses. The break up is as per Income: expected, actual, difference, Savings (emergency funds): expected, actual, difference and finally Expenses: expected, actual, difference and at the bottom it has a column to mention cash shortage / surplus viz-a-viz the income. thrivent.com | This format divides the month into bi-week i.e. in two parts of 15 days each. This sample is useful for people who get paid on bi-weekly basis. The sample includes 3 tables first table provides information about 15days fixed income, extra income and total income similarly second table provides information about next 15 days fixed income, extra income and total income. The third table includes details about the monthly expenses and a column to show projected income v/s expense, actual income v/s expense and the difference amount. The best thing about personal weekly budgets is that they are flexible in many ways. 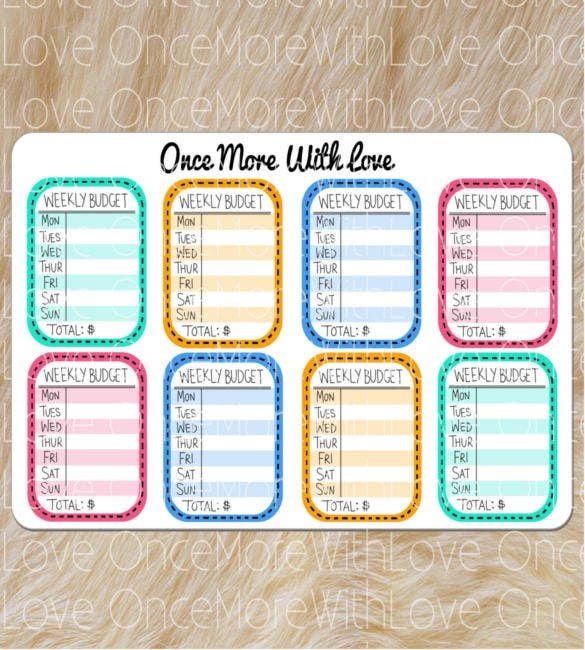 All you need is a table with different columns for entering things that you buy often. You can draw this on your notebook if you carry one often. 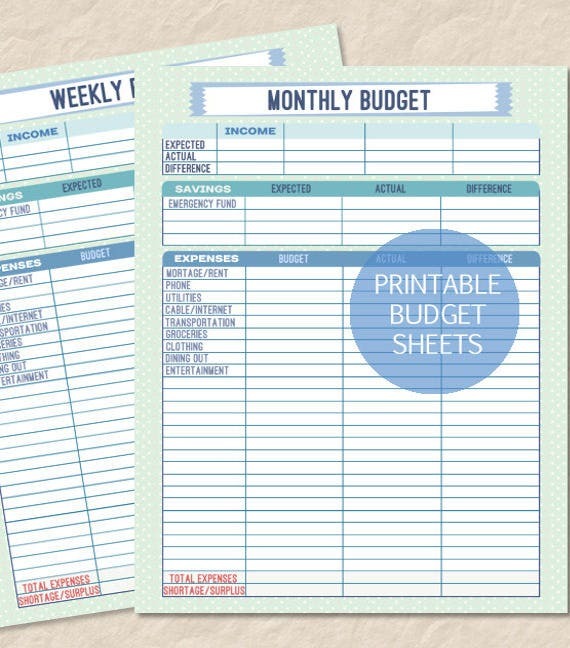 Alternatively, download a budget template to your pc or Smartphone. Focus on Savings: Maintaining a template gives us a fair idea whether or not our saving goals are being met. 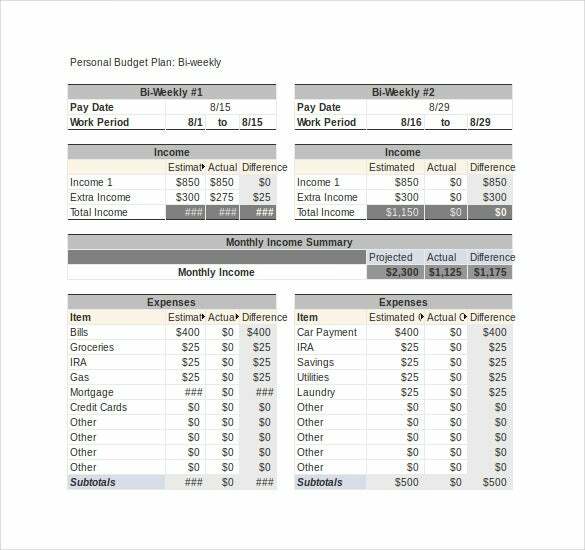 Control outgoings: Budget templates helps us control our outgoings by providing us the synopsis of expense and income. 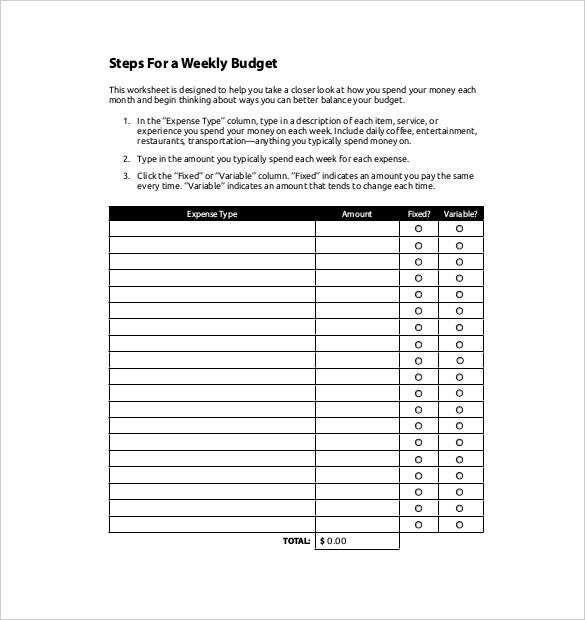 Early indicator: A weekly budget template can serve as an early indicator of your approaching financial crunch due to over spending. Savings for unexpected expenses: Weekly budget monitoring helps in saving for expected and unexpected emergency costs. Saving for a rainy day is very important as unexpected circumstances and expenses can arise uninformed. A weekly check on the income and expenses helps us in prioritizing our needs from our wants, it also helps to keep our finances on track.Weekly planning and monitoring the budget helps us to identify and curb out unnecessary expenses and reach our financial goals. 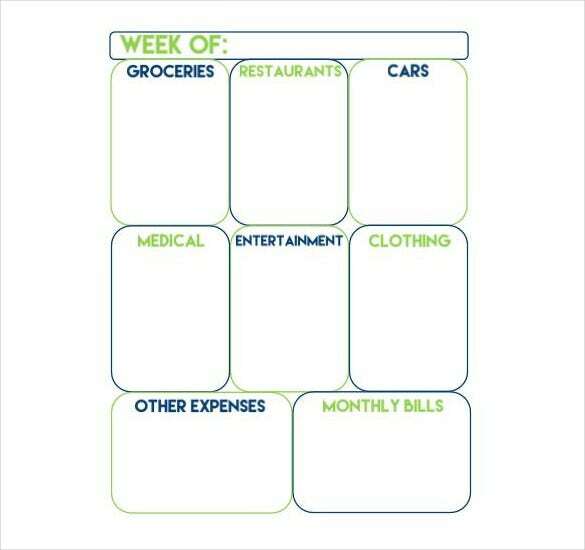 Also weekly or bi-weekly review of expenditure and income saves us from the end of the month stress due over spending. So let set our saving priorities today by downloading weekly budget template. If you have any DMCA issues on this post, please contact us!